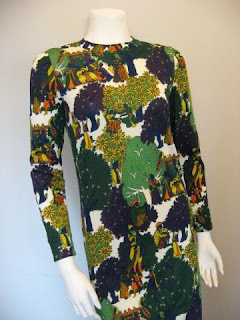 Continuing in this week's look at the masters of patterned knit dresses is today's entry on Robert Goldworm, who wedded American mercantile drive to the artistry of Italian printmakers, creating a line of dresses that overturned the barriers between garment and art. There is a wonderful interview with Goldworm's daughter Susan on the vintage site Playing Dress Up All Day Long . . . choice tidbits include how Robert came to reshape a business founded by his mother in the late 1920s into one of the most innovative knitwear operations in the world. Robert went to Milan after graduating from New York University with the idea of creating a new kind of dress. It was knit along the simple lines of a t-shirt, but finished to the highest standards of Italian hand craftsmanship in terms of seaming, closures, and other technical details. Susan relates how her father was influenced by the stacks of art books that filled their home -- especially the near- and pure abstraction of van Gogh, Picasso, Paul Klee, Jasper Johns, Mondrian. His eye was also caught by the exotic . . . the dress at top, featuring an Indian-inspired print, would have captivated buyers eager to convey their own cosmopolitan inclinations in a time when the world was opening up to long-haul air travel. While his lines could be categorized under the category of 'art to wear', Goldworm was also designing to a mandate of ease and suitability for travel. 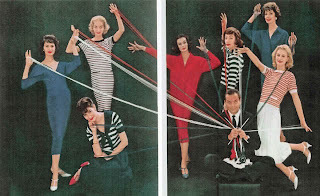 Knit dresses filled that role perfectly, as this extraordinary report in Sports Illustrated (which actually wrote about cutting-edge sportswear for women in the '50s) shows . . . Seated above in a spider web of his own designs is the gentleman who is responsible for the knitted fashions favored by the American woman who travels fastest, farthest and neatest. Goldworm's dresses are widely available at vintage outlets at prices that seem very reasonable, given their significance in American fashion history. Look around, and see if you don't catch a sense of how marvelous these designs must have seemed to women seeking to expand themselves . . . through travel, through art, or, barring that, an expedition through the rails of a great department store. Sports Illustrated ad from Viviene18328 at Photobucket. India-print dress at riceandbeansvintage.com. 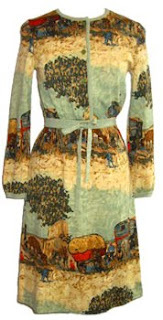 Van Gogh dress from legacy-nyc.com. Many thanks to all.